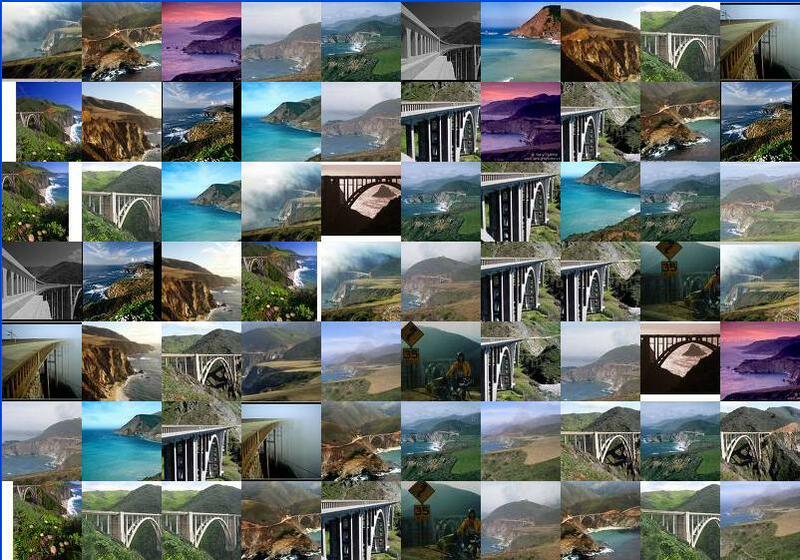 Montage-a-google is a simple web-based app that uses Google’s image search to generate a large gridded montage of images based on keywords (search terms) entered by the user. A click on any image (max 20 images, scattered with dups over a 9×12 grid) takes you to the source of the image. The grid size can be fiddled with, as can other features using the “advanced” mode. You’ll need Flash player version 8 (or up) to run the app. If you want to save your results, use [alt][print scrn] (if you use a PC — don’t talk to me about Mac stuff) to copy the image. Then pop the image into your photo app with ^V and clear the bits you don’t want before printing. Not bad for a first try. I could’ve trimmed the edges better but I won’t go back and fiddle some more because at some point conscientiousness veers into compulsiveness and we’re not exactly creating lasting art here. Check out the photos tagged with “montage-a-google” on Flickr. I love Laura Lippman‘s Memory Project, as I might’ve mentioned once or three (maybe four!) times before. Her current memory burp has to do with her December holiday memories back when (she always deals first) and her questions: What’s the best gift you ever gave? What’s the best gift you ever got? And have you ever had to fake it? Over the years. So many presents. Given. Received. The present I especially remember was … Manhattan Beach, CA. Christmas 1956. My dad was teaching at UCLA that year. We were living in a funky old house on the Strand, which (if my Web sleuthing is accurate) has been bulldozed for condos since the last time I swung by, maybe twenty-five years ago. Alas. Such a house. So many memories for such a short time. We were only there for a school year. Come June 1957, my dad, with five children to provide for, left academia and signed on with Henry J. and Kaiser Aluminum. We relocated to Belem, Para, Brazil for the next two years or so, while Dad searched for bauxite, exploring the Amazon basin, whacking his machete through the jungles. Christmas 1956. I was all of four years old and already not exactly your paint-your-fingernails sort of girl. Santa brought me a bright blue metal dump truck that really dumped. You could put four Campbell’s soup cans in the bed. And dump them out. And put them back in. And dump them out. I was in hog heaven. Another memorable present was something my older brother gave me several years after we got back from Brazil. That Christmas, he took an old cruzeiro coin and polished it up then soldered a small brass safety pin on the back to make me a pin. I still have that pin in a place of honor in my jewelry box forty-some years later. The best present I ever gave? I can’t remember, but this Christmas we had the serendipity to decide to give the older younger one a gift certificate to Borderlands, a terrific SFF/H store out on Valencia. I wanted to stick the gift certificate in a book and we found a signed copy of Pratchett’s first Johnny Maxwell book. I tucked the gift certificate into the book. Turns out the older younger one had been searching for years for that title. He had the later Johnny Maxwells but wanted to start with #1 and hadn’t been able to find it. The fact that we’d found him a copy — signed — made his Christmas. Thanks for the memories, Laura. The odds are against you, but they are less against you if you actually write and submit something. Or, as Miss Snark says, it doesn’t really matter what the acceptance/rejection rate is for a given agent or publisher when you’re submitting your work. What matters is your work. She signed a client who had had eighty-one rejection letters before she signed him. It only takes one agent to say yes, Miss Snark reminds us. What interests you. What doesn’t. And how that’s mirrored in your on-line persona, nay, even your RL persona. Years ago, when I was living with a different husband, the husband and I went to a Silva Mind Control scoop-em-in-and-hook-em-up seminar. What I took out of that seminar is that what you write about and what you care about and what makes you flinch and what makes you cry or yell or laugh is what interests you, what makes you tick. The Silva folk had you think about someone you knew well. What did you really like about them? What about them irritated you all to heck? Ten things for each list. The upshot of the lists was that what you like and appreciate and what irritates you all to heck are all things that matter to you. If someone twitches their foot and foot twitching doesn’t ping your consciousness, you’ll never mention twitching feet on your list of like/irritate/hate. If what makes you twitch are people who are chronically late, you will probably mention that the person you’re profiling is chronically late, if they are. Back a day or two ago in Usenet land, someone made a crack that struck me all wrong. Still does. He’s now backstepping around the pile of warm stuff that oozed out of his psyche. I don’t care if the crack was intended as a troll. The crack was a reflection of who the person was. One wouldn’t make the crack if it wasn’t handy, somewhere in the psyche. I think wotzizname Gibson probably had Jews on the brain before he was picked up for DUI by a Jewish cop and spewed his memorable spew. I think whatzizname Michael Richards had a fizz on his brain when he lashed out at the comedy club. You don’t lash out about things that aren’t already stewing on your brain. You must’ve seen someone lash out at something and you just didn’t get it. You said, huh? We used to have to deal with a family member who’d make weird attempts to annoy us and get us twitching and spitting. She’d do one of her gotchas and we could tell she was trying to get us to twitch. We’d sit there and wonder, what is she trying now? Why does she think what she’s doing would upset us? We’d think for a while and then … Oh … that’s it. Silly girl. She’d do off-the-wall stuff intended to annoy. Well, she’d be annoyed if someone did something like that to her and she was so self-centered she didn’t realize that what annoyed her might not annoy others. She’d hope we’d whine and complain and raise a fuss and storm out of the family and behave badly. We let it go. What’s “stuff” anyway, crazy girl. She was so self-centered she never could understand that what she did reflected more about how she ticked inside than it ever had anything much really to do with us. She was avaricious and expected everyone else to be. She was suspicious of everyone because she knew that everyone should be suspicious of her. She’s no longer part of the family due to circumstances changing. The only thing I really miss is having a front row seat on her soap opera life. Boy, that girl had a weird view of how people should treat each other. I would love to see how her world view impacts her life these days — how many friends have deserted her, how many tradesmen have cheated her, how many people are just being mean-mean-mean to her. I would love to know what’s going on in her life, but not enough to get back in contact with her. I’m curious, but not enough. In a similar fashion, the personas that people assume on Usenet ooze with things that they are aware of and care about, things that make them tick or tick them off. I’m the girl who rummages up URLs. I’d never affect the persona of someone who cared about pink shooz. What? Or someone who cared about The Bulls. They lost last night? What? Next time, watch what people pay attention to, what they react to, what sort of button pushing really sets them off and you’ll see what’s important in their lives. You’ll also see that people who push buttons pick buttons that they care about. People talk about, act out, or conspicuously avoid things that they are most concerned about. If the subject didn’t make their nerve endings twitch, it would never occur to them to even notice. Sam Gallegos is a freelance writer in Denver who helped Randy Shilts with research, when Shilts was writing CONDUCT UNBECOMING: Gays and Lesbians in the U.S. Military. Judith Regan, eat your heart out. Rising seas, caused by global warming, have for the first time washed an inhabited island off the face of the Earth. The obliteration of Lohachara island, in India’s part of the Sundarbans where the Ganges and the Brahmaputra rivers empty into the Bay of Bengal, marks the moment when one of the most apocalyptic predictions of environmentalists and climate scientists has started coming true. As the seas continue to swell, they will swallow whole island nations, from the Maldives to the Marshall Islands, inundate vast areas of countries from Bangladesh to Egypt, and submerge parts of scores of coastal cities. The younger younger guy flew in from Boston late — after eleven — on the 23rd. He found me snoozing in the wait lounge when he arrived. Luckily his nibs was awake. I’d been up past my bedtime for the previous two or three nights and had crashed. We got back to our place and got to bed after midnight, more like one a.m. or so. I was up before seven-thirty (being careful not to wake up the younger younger guy who was asleep on the living room floor) to head down to Liguria Bakery for focaccia for us to snack on during the day before our big Christmas Eve dinner and for a couple raisin focaccia to take to the family Christmas. But it turned out I wasn’t the only one with such plans. After over an hour and a half in line, I reached the front door around nine-thirty and discovered the bakery had just sold their last piece of my favorite rosemary focaccia. I winged it with the two raisin focaccia I was planning to bring to Christmas brunch, plus one each of garlic, rosemary garlic and two tomato/pizza. Turns out they mixed up the order a bit and I wound up with onion instead of the garlic. I prefer the garlic to the onion (others have the exact opposite preference), but we survived the mixup. Who knew that focaccia on Christmas was such a big tradition for some people? There were people standing in line who were buying twelve sets of tomato focaccia for Christmas Day. People had driven over from Pacifica and up from the south bay, and that was only the people I talked to or overheard a couple spaces ahead or behind me in line. I don’t know if the people still in line behind me got the focaccia they wanted before Liguria ran out for the day. You snooze. You lose. Now that I know their Christmas Eve hours have them opening at 6 a.m. (instead of the 7 a.m. opening hours that are “normal” for weekends), I’ll know to be on their doorstep at 6 a.m. on Christmas Eves in the future. The older younger guy and his guy drove up from Santa Cruz in the afternoon and we chatted and sat around. I made cheese danish coffee rolls (from scratch … yeast and knead and raise and all) while the others read until it was time to walk over to the HOPR (hopper) AKA The House of Prime Rib on Van Ness for a Christmas Eve dinner. Dinner reservation was for 10 p.m., the earliest we could get. We were seated fifteen minutes, a half hour late, but that was okay. The time in the bar area gave us a chance to watch the passing crowd, and what a motley crowd it is. The HOPR is a favorite with a wide variety of people. Dinner was exactly what we expected. How could it not be when the menu is pretty straightforward and hasn’t changed since it opened fifty-plus years ago. The only recent change is an option for the vegetable side: you can now order creamed corn in lieu of the creamed spinach, a result of the E.coli spinach problem earlier this year. Who knew that Christmas Eve dinner at HOPR was a long-standing tradition for some families? I didn’t, although it may become one for us. More than one family party left, saying “Thanks. Good-bye. See you next year.” to the wait staff. I swear the guy and his son who were standing in front of me at Liguria were waiting for a table with the wife and daughter of the family. Filled to the brim and carrying our bright red HOPR bags with our uneaten pieces of prime rib stored inside, we walked back home. We didn’t get to bed until after midnight. Up bright and early, we turned on the sparkling tree and had focaccia and cheese danishes for a snack before we opened our presents to each other, to and between the five of us. Oddly enough, the presents were book-book-book-(gift certificate for book store)-book-book-(magazine subscription)-book-DVD-book-book-mug. After the opening of presents, we loaded up both cars with presents for the rest of the family and focaccia (and hard sauce to go with it) and cheese danishes and what-not and headed off to the Towse family Christmas in the east bay. Over the bay and through the tunnel and up to the water and east and … we arrived. The day was good. Far better than I could’ve hoped for. I missed Dad, of course, but it was good to see us all together and together. My present for the matriarch was a box of mixed XOX truffles, which she loved. I mean really loved. Great! Now I know what to bring her for a treat when we visit. Christmas was everything I wanted. We didn’t get or give loads of gifts. There were no piles of presents, no conspicuous consumption. I had what I wanted: family and peace and having us all together. Everything and all that I wanted. Here’s to magic. Here’s to wonder. Here’s to family. Here’s to love. Who would’ve thought after all the years and all that living that James Brown would die on Christmas Day of congestive heart failure/pneumonia in a hospital at age 73? This was certainly not the way I would’ve ever figured he’d leave this earthly realm. He always seemed more a “bang!” than a whimper-exit sort of guy. Spin your copy of “I Feel Good” and wish the man a speedy journey. I think he would’ve been amused to see the news reports and obits pour in: Siberian News Online, Virgin.net, Sky News Australia, the Telegraph, BET, PBS, Newsday, Bostonist, Irish Times and fourteen hundred plus others. Well, clobbered that old post (this one?) while I was writing up something new. We listened Friday night to Vienna Teng at the Independent, preceded by a delish dinner at NOPA. While we were watching the show, my seat gave a shimmy, but then the seats at the Independent (and the tables) tend to shimmy. If there’d been chandeliers, the chandeliers would’ve rattled. No one else seemed to notice. Quake on the Susan Hayward Fault. One large. Two aftershocks. Here’s hoping my friends in earthquake country have their houses tied to their foundations, a stash of water put away and whatever they’ll need when they need it. On Thursday night we were out to dinner (more on that to follow) and one of our dinner companions said he’d been talking to some cops about what they thought he’d need after an earthquake. Water, they said. A radio with batteries or a hand crank so you can get the news. And a side-by-side. We don’t have a side-by-side. A 3.5 this Saturday morning at more or less the same spot as before — the Susan Hayward fault in Berkeley. Three over 3.0 in less than three days?